Schedules are used to trigger call routing events in BroadSoft. Special rules guide how schedules appear and function. When you log in, you will be at the group level. On the Schedules page, you will immediately see a list of group level schedules. To add a new schedule, press the Add button. Enter a unique name in the box and press OK to save this and begin to modify this new schedule. Back on the Schedules Page, you can see the newly-added schedule name. However, the new schedule has no events – it is empty. Press Edit to see more details and configure it. Add new events with the Add button. Once you are on the Event Add page, you can add an event to the schedule. Give the event a unique name. Set the start and end date and time of the event. Or set the event as an all day event. Frequently, the schedule events will need to repeat. 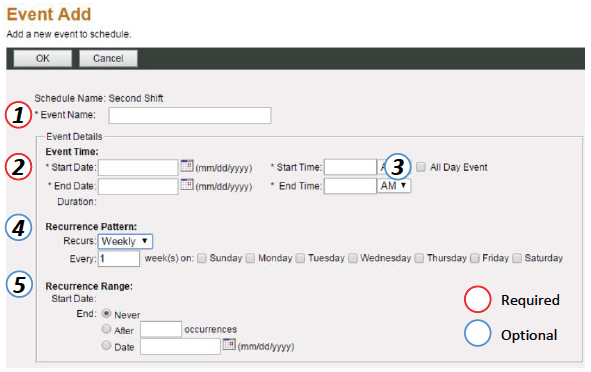 The drop down menu will allow you to set the recurrence pattern. Decide when the repetition will end. Quite often this is never. When you have entered the event details, press OK to save and return to the Schedules page.